The ladies event at the 2018 Winter Olympics closed Friday with a dramatic showdown between rival Russian stars Alina Zagitova and Evgenia Medvedeva. The two Russian teenagers had been favored to take the gold and silver medals in Pyeongchang for months. Their expected dominance came to fruition at this Games, where they led the standings in both the team and individual events. Overcoming the pressure of being favorites, as well as the political drama surrounding Russia’s ban from these Games, the two Russian stars delivered the best programs they possibly could to claim gold and silver in the ladies final. It was Alina Zagitova who came out on top, winning Olympic gold at 15. Last year at this time, Zagitova was still competing in the junior ranks of ladies’ skating. But she hit the senior international scene with a big impact this year. She went undefeated this season, capping her young career with the gold medal in Pyeongchang. Zagitova’s success at the Olympics, as elsewhere this season, was based on technical consistency and strategy. Zagitova skated her long program cleanly, with no errors. She landed the most difficult jump combination in the event (triple Lutz/triple loop), plus 5 other triples. Zagitova received all-positive marks from the judges on the grade of execution (GOE), or quality, of her technical elements. She also earned maximum levels (level 4s) on all her spins and her step sequence. Additionally, the risky strategy of putting all her jumps in the second half of the program paid off. Zagitova received a 10% bonus for each of her jumps, pushing her technical base value 3.68 points ahead of teammate Medvedeva’s. Numerically, Zagitova tied with Medvedeva in the long program (although Medvedeva ranked first due to higher program components scores [PCS]). Zagitova’s 1.31-point lead from the short program gave her the overall win. Skating last in the final group, Medvedeva put out a valiant effort in the long program to fight for the gold medal, but could not overcome her deficit from the short program. Medvedeva landed two triple/triple jump combinations, plus three more triples, in her Anna Karenina program. Like her teammate, she had all-positive GOE marks and all level 4 elements. 18-year-old Medvedeva skated with passion and attack, earning eleven 10.00s in her PCS scores. She took the advantage over her teammate in both GOE (+1.24) and PCS (+2.44) in the long program. However, this was only enough to offset Zagitova’s technical base value advantage. The two Russians tied numerically in the long program; so Zagitova’s lead from the short program decided the outcome. Despite dominating the sport for the past two years, two-time World champion Medvedeva had to settle for silver in Pyeongchang. Kaetlyn Osmond of Canada won the bronze medal. She landed a difficult triple flip/triple toe combination and five other triples (including the triple loop, often a trouble spot) in her long program. She also had all level 4 elements. The only mistake came on her triple Lutz, as she turned out of the landing. The 22-year-old Canadian showed excellent skating skills and nice maturity in her Black Swan program and earned high PCS scores (including one 10.00). She posted a new personal-best score in the long program to take bronze. Satoko Miyahara of Japan delivered an inspired performance in the long program to place fourth, skating beautifully to Madame Butterfly. Recognized among fans for her artistry, Miyahara showed lovely musicality, extension, and detail in this program, hitting some beautiful spiral and spin positions. Miyahara also skated with good speed and flow throughout. She hit a difficult triple Lutz/triple toe combination, plus five other triples. Although underrotation calls are often a problem for Miyahara, her jumps looked quite clean in this program, and she did not get any calls here. Miyahara’s technical base value was slightly higher than Osmond’s; however, her GOE and PCS marks were lower. The 19-year-old Japanese skater fell short of a medal, but expressed satisfaction with her performances. Carolina Kostner of Italy placed fifth. This was the fourth Olympics for the 31-year-old Kostner; she won bronze four years ago in Sochi. Kostner had some technical mistakes in her free skate. She spun out of her triple flip and underrotated the loop in her double Axel/loop/triple Salchow combination. She was also a bit forward on a few jumps. Her technical (TES) score was rather low (56.04). However, she showed beautiful artistry in her Afternoon of a Faun LP. The joy in her skating was evident, as was her musicality. Kostner’s languid, soft arms, fine extension, and superb skating skills were well-appreciated by the judges, and she earned strong PCS scores. 17-year-old Kaori Sakamoto of Japan skated very well to take sixth place. 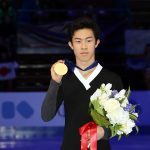 Like Alina Zagitova, this is Sakamoto’s first year as a senior-level skater. She showed good composure in her long program. She landed a triple flip/triple toe combination, plus 5 other triples. Sakamoto has exceptional flow and speed in and out of her jumps, and often good height as well. However, 2 mistakes kept her from contending for a higher placement. Her triple Lutz received an edge call, reducing its value by almost 2 points. She also spun out of a late triple loop, losing another 1.40 points. Sakamoto showed excellent skating skills in her Amelie LP. But at 17, she is still developing in terms of extension, line and artistry. Her PCS score (68.11) therefore lagged several points behind the top 5 ladies. 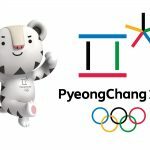 Da Bin Choi of South Korea, 18, had a career-best performance to unexpectedly place seventh in Pyeongchang. Perhaps inspired by skating in her home country, Choi set new personal-best scores in both programs at this Olympics. Her Doctor Zhivago long program was quite impressive technically. After omitting the second jump in her planned opening combination, Choi gutsily added it to a triple Lutz much later in the program, along with a double toe. The resulting combination earned an impressive 13.16 points. Choi landed 6 triples total and skated with nice emotion and lyrical quality. After a very disappointing short program, Maria Sotskova of Russia redeemed herself with a fine free skate to place eighth. Technically, it was a strong outing for Sotskova. She doubled the last jump in her planned triple flip/half loop/triple Salchow combination, but that was the only mistake. She landed a triple Lutz/triple toe combination and four other triples. She also showed good speed and nice presentation in a serene long program to Clair de Lune. Unfortunately, it was a somewhat disappointing night for the American ladies. Bradie Tennell was the highest-placing U.S. lady, finishing ninth. Skating in her first Olympic Games, the 20-year-old started well with a good triple Lutz/triple toe combination. Tennell hit three more clean triple jumps, but spun out of her triple Lutz and her second triple toe in combination. Both jumps were called as underrotated. After an excellent skate in the team event long program, Mirai Nagasu of the U.S. was hoping for another good result in this event. Unfortunately, it didn’t happen. Nagasu, 24, missed the takeoff of her opening triple Axel and received no points; she also singled her triple Lutz later in the program. Nagasu did land a triple flip/triple toe and four other triples, and there were some lovely, elegant moments in her Miss Saigon long program. Afterward, Nagasu took some comfort from looking back at her performance in the team event. “To become the first American [lady] to land a triple Axel at the Olympic Games is historical. I’ll remember [that] forever,” she said. American Karen Chen placed eleventh. 18-year-old Chen struggled in her Jalousie tango long program. She omitted the second jump in her opening triple Lutz/triple toe combination, fell on the triple loop, and spun out of the triple Salchow. She also got hit with two underrotation calls.